Last week, game publisher Bulkypix released Dead Effect onto Google Play. The game is beginning to soar through the ranks, featuring very good graphics and frightening gameplay. 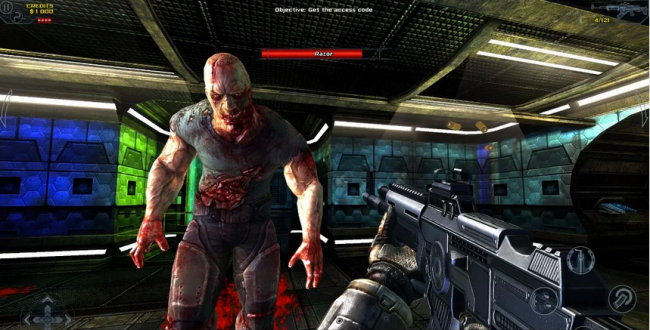 It is your typical zombie “kill ’em all” first person shooter, but since we all know that no one can hear you scream in space, we think this game has a fantastic setting. The gameplay is fast and the controls are extremely fluid, but be warned, you need a device capable of some serious computing power to play. It is quite CPU intensive, with the Note 3 even heating up quite a bit during gameplay. But beyond that, there are a ton of customizable weapons, you can choose characters you want to play, and you can just have fun killing the undead. It’s Halloween time after all. The big bonus is that this game is free. Yes, there are IAP, so keep that in mind. Let us know what you think.